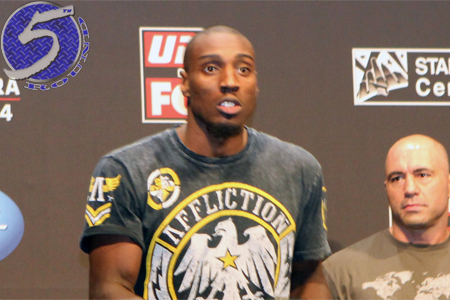 Phil Davis (pictured) and Glover Teixeira were both looking to bounce back from disappointing losses on Saturday at UFC 179. It was far from a must-win for either light heavyweight, but it was a critical contest. Davis manhandled the Brazilian, to put it mildly. “Mr. Wonderful” was never close to finishing Teixeira in route to a landslide unanimous decision victory, but it was clear Davis had put his defeat to Anthony Johnson in his rear-view mirror. After the win, Davis noted that he’s now posted wins over Brazilians Lyoto Machida and Teixeira in their homeland, and he would like to run the trifecta by getting one against Anderson Silva, who was sitting front and center. Silva didn’t appear too interested. UFC 179 took place inside Maracanazinho Gymnasium in Rio de Janeiro, Brazil.